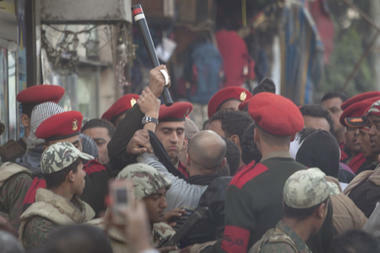 Military police officers scuffle with protesters as they try to clear Tahrir Square in Cairo, Egypt, Monday, Feb. 14. Egypt’s military rulers dissolved parliament Sunday, suspending the constitution and promising elections in moves cautiously welcomed by pro-democracy protesters. A coalition of activists, Internet organizers, and opposition political groups that formed the backbone of the Egyptian revolution joined the country’s new military rulers today for a “getting to know you meeting.” They promised to hold the new regime’s feet to the fire on political reform. Egypt is in a period of incredible political ferment, with the military promising to usher in the substantive democratic reform that hundreds of thousands of Egyptians demanded on the streets of Cairo and beyond. But the military, an integral part of former President Hosni Mubarak’s regime, faces skepticism from some in Mr. Naguib’s umbrella group – as well as a potential challenge from laborers who have launched a series of strikes to capitalize on the revolution’s momentum. A few hours after the meeting, the junta issued a communiqué with ominous hints for how ongoing protests will be dealt with. The military said further protests will harm national security and urged protests – particularly labor strikes – to stop. While it stopped short of outright banning demonstrations, the use of the language of national security – the statement also warned of the chance that “irresponsible groups” will take advantage of further protests to harm Egypt – strongly implied that it won’t stand aside indefinitely. The military pushed former President Hosni Mubarak from power on Friday and took charge for what they say is the good of the nation. On Sunday, they dissolved both houses of parliament, suspended the Constitution, and promised sweeping political reforms to allow for fair elections within six months. At that point, the military junta led by Gen. Mohammed Tantawi (ret.) has promised, they will return to barracks. Mr. Naguib says his umbrella group for young democracy activists, which includes members of the Muslim Brotherhood Youth and young supporters of former United Nations nuclear chief Mohamed ElBaradei, told officers today that they intend to keep the military to its promises. He says organizers are confident that they’ll be able to energize large protests at the end of the week, even as military police cleared away the last vestiges of the extraordinary pro-democracy encampment that took over Cairo’s Tahrir (Liberation) Square during the popular uprising that started on Jan. 25. Is he right? The Egyptian military has been urging Egypt to get back to work and is seeking to project an air of normalcy. Many of the youth who mobilized at Tahrir have been inclined to trust the military, and average Egyptians are wary of a confrontation with the military after two weeks in which the Army stayed neutral and allowed Mubarak to be swept aside. CAIRO – Egypt’s military announced on national television it had stepped in to secure the country and promised protesters calling for President Hosni Mubarak’s ouster that all their demands would soon be met. Mubarak planned a speech to the nation Thursday night, raising expectations he would step down or transfer his powers. Protesters packed in Cairo’s central Tahrir Square broke into chants of “We’re almost there, we’re almost there” and waved V-for-victory signs as more flowed in to join them well after nightfall, bringing their numbers well over 100,000. But euphoria that they were nearing their goal of Mubarak’s fall was tempered with worries that a military takeover could scuttle wider demands for true democracy. Many vowed to continue protests. The developments created confusion over who was calling the shots in Egypt and whether Mubarak and the military were united on the next steps. The military’s moves had some trappings of an outright takeover, perhaps to push Mubarak out for the army to run the country itself in a break with the constitution. But comments by Mubarak’s aides and his meetings with the top two figures in his regime — Vice President Omar Suleiman and Prime Minister Ahmed Shafiq — before his speech suggested he may try to carry out a constitutionally allowed half-measure of handing his powers to Suleiman while keeping his title as president. That step would likely not satisfy protesters, and it was not clear if the military supports such a move. The United States’ CIA director Leon Panetta said Mubarak appeared poised to hand over his powers to Suleiman. President Barack Obama said, “We are witnessing history unfold” in Egypt and vowed the United States would continue to support an orderly and genuine transition to democracy. But he and the White House gave no indication if they knew what the next steps would be. The U.S. has close ties to the Egyptian military, which Washington give $1.3 billion a year in aid. The dramatic developments capped 17 days of mass anti-government protests, some drawing a quarter-million people, to demand Mubarak’s immediate ouster. What began as an Internet campaign swelled into the stiffest challenge ever to Mubarak’s nearly 30 years of authoritarian rule, fueled by widespread frustration over the regime’s lock on power, government corruption, rampant poverty and unemployment. The protests escalated in the past two days with labor strikes and revolts by state employees that added to the chaos. The rapid ramping up of the unrest was overwhelming the regime’s efforts, led by Suleiman, to manage the crisis. In a sign of the government’s distress, Suleiman warned parts of the military or police could rise up in a coup. The military’s dramatic announcement in the early evening appeared to show that that its supreme council, headed by Defense Minister Field Marshal Hussein Tantawi, had taken the reins of leadership. Footage on state TV showed Tantawi chairing the council with around two dozen top stern-faced army officers seated around a table. Not at the meeting were Mubarak, the military commander in chief, or his vice president Suleiman, a former army general and intelligence chief named to his post after the protests erupted Jan. 25 and has led regime efforts to resolve the crisis. “All your demands will be met today,” Gen. Hassan al-Roueini, military commander for the Cairo area, told thousands of protesters in central Tahrir Square. The protesters lifted al-Roueini onto their shoulders and carried him around the square, shouting, “the army, the people one hand.” Some in the crowd held up their hands in V-for-victory signs, shouting “the people want the end of the regime” and “Allahu akbar,” or “God is great,” a victory cry used by secular and religious people alike. Beyond suggestions that Mubarak would go, however, the military did not directly address whether it intends to carry out the protesters’ wider demands for full democracy — or if it would demand that protests stop. Protesters in the square began chanting, “civilian not military,” a signal they do not want military rule, and many vowed not to end their demonstrations. At one entrance to Tahrir, thousands who turned out after the military announcement lined up to join in. “If he steps down, that’s positive, but that doesn’t mean our demands have been met,” said one protester, 27-year-old Kareem Nedhat. “Handing power to the army is acceptable for a transitional period, but there are still demands that still need to be met. We need to stay in the square.” He said protests should continue until the army lifts emergency laws, dissolves parliament. He said the council was in permanent session to explore “what measures and arrangements could be made to safeguard the nation, its achievements and the ambitions of its great people.” That suggested Tantawi and his generals were now in charge of the country. Protests on Thursday increasingly spiraled out of the control. Labor strikes erupted around the country in the past two days, showing that the Tahrir protests had tapped into the deep well of anger over economic woes, including inflation, unemployment, corruption, low wages and wide disparities between rich and poor. In the past two days, state employees revolted against their directors, and strikes erupted in a wide breadth of sectors — postal workers, electricity staff and service technicians at the Suez Canal, in factories manufacturing textiles, steel and beverages and hospitals. Riots broke out in several cities far from Cairo. Protesters angry over bread and housing shortages or low wages burned the offices of a governor and several police headquarters while police stood aside. Professionals and workers began joining the crowds of anti-Mubarak protesters in Cairo’s Tahrir Square. On Thursday, hundreds of lawyers in black robes broke through a police cordon and marched on one of Mubarak’s palaces — the first time protesters had done so. The president was not in Abdeen Palace, several blocks from Tahrir. The lawyers pushed through a line of police, who did nothing to stop them. Tens of thousands were massed in Tahrir itself, joined in the morning by striking doctors who marched in their white lab coats from a state hospital to the square and lawyers who broke with their pro-government union to join in. “Now we’re united in one goal. The sun of the people has risen and it will not set again,” one of the lawyers, Said Bakri, said before the series of military announcements. Youth activists organizing the protests planned to up the pressure on the streets even further, calling for an expanded rally on Friday, hoping to repeat a showing earlier this week that drew about a quarter-million people. Friday’s protest was to be expanded, with six separate rallies planned around Cairo, all to eventually march on Tahrir, said Khaled Abdel-Hamid, speaking for a coalition of groups behind the protests. If demands are not met, “we will join Tahrir and camp there,” said one bus driver, Mustafa Mohammed, who said he has been working since 1997 and only earns 550 Egyptian pounds a month, about $93. “We are immersed in debt,” he said. In the face of a revolt by journalists over anti-protest propoganda in state media, the pro-government head of the journalists’ union, Makram Mohammed Ahmed, said he was going on indefinite leave. The state prosecutor summoned him over lawsuits filed by journalists accusing him of “negligence” in defending journalists’ rights. AP correspondents Sarah El Deeb, Hamza Hendawi, Hadeel al-Shalchi, Lee Keath and Marjorie Olster contributed to this report.